Would you like to join the Board? Bradford LGB&T Strategic Partnership (otherwise known as Equity Partnership) is a Company Limited by Guarantee and a Registered Charity. As such we are required by law to have a constitution and a Board of Trustees. The Equity Partnership plays a key role in the development of lesbian, gay, bisexual and Trans (LGBT) communities, challenges homophobia, transphobia and heterosexism, ensures that the long term needs of LGBT communities are provided for, and acts as a network for advancing LGBT issues. We operate across the District of Bradford and beyond. Our objectives include supporting LGBT community groups to set up and thrive, to help those communities and individuals to network and have a voice, to influence the policies and practices of mainstream organisations so that LGBT communities can access their services, and to develop and manage the Equity Centre in central Bradford. We are seeking Board members (Trustees) who are lesbian, gay, bisexual and Trans and who would be interested in joining our enthusiastic and committed Board which meets on the last Thursday of every month. To ensure that the Equity Partnership is properly and effectively governed and managed we provide an induction and opportunities for training. To be a Trustee you will need to be a Member of Equity Partnership and able to devote some time to the role. The time commitment includes participating in Board meetings, and sub groups. 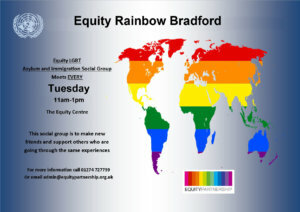 occasional sessions for annual review and planning, and volunteering at some annual events such as Bradford LGBT Pride. We can offer you experience of management, personnel issues, project management and finance. By appointment (co opting): there are 14 places on the Board and if these are not all filled by the AGM election process then Trustees may appoint (co opt) suitable members who will then stand down at the next AGM and if they wish, go through the election process. We encourage anyone who is interested and identifies as lesbian, gay, bisexual or Trans to meet with the chair of our Board of Trustees to talk about how we could work together. We are keen to ensure that LGB&T communities are well represented through the diversity of the Board of trustees. Occasionally we will advertise for board members, particularly when we are seeking a particular skill. Time and a willingness to make a contribution are the most important qualities you can possess to be a success!